​In 2010 Akron Children’s began its journey away from paper medical records to Epic, our electronic medical record system. Eight years later, we rank in the top 6% of hospitals nationally that have fully attained paperless EMR implementation. HIMSS Analytics, a not-for-profit subsidiary of the Healthcare Information and Management Systems Society, recently informed the hospital it achieved Stage 7 (the final stage) on its EMR Adoption Model scale. This scale is used to rank the nation’s 5,300 hospitals. Akron Children’s has invested more than $50 million in Epic, which now covers all inpatient and outpatient areas. Harun Rashid, chief information officer, said reaching HIMSS Stage 7 was challenging because of the stringent requirements. According to the Journal of Medical Internet Research, most U.S. hospitals won’t achieve this elite status until 2035. Stage 7 designation recognizes Akron Children’s for achieving key implementation goals, such as having its lab, pharmacy and radiology management systems live and operational as well as using data analytics that allow providers to analyze information and improve care delivery and patient safety. The risk of medical errors is also reduced as the EMR has checks in place via barcode scanning to ensure the “five rights” of medication administration – that the “right” patient is getting the “right” medication in the “right” dose, at the “right” time, and by the “right” route. Entering prescriptions into a patient’s EMR also means illegible handwriting can’t cause a medication error. One of the requirements of the hospital’s Stage 7 journey included a case study showing where the hospital gained value and made efforts in improving quality. The PICU served as one of the focus areas for the case study. By implementing the use of asthma treatment plans, patient education and administering flu vaccines before discharge, the hospital saw a 74 percent reduction in costs associated with asthma medications in the PICU. In addition to its Stage 7 designation, the hospital also recently achieved “Most Wired” distinction for its fifth consecutive year. The Most Wired survey provides industry-level benchmarks for IT adoption for operational systems, security , patient engagement and clinical performance – recognizing organizations with exceptionally high IT systems and integration throughout their enterprise. According to the College of Healthcare Information Management Executives (CHIME) who conducts the survey, the results show the healthcare industry’s shift in focus from technology acquisition to the integration of technology into strategies to improve population health, capitalize on data analytics, boost patient engagement and introduce new efficiencies. Harun says it’s been gratifying to have groups like HIMSS and CHIME recognize the hospital’s efforts. 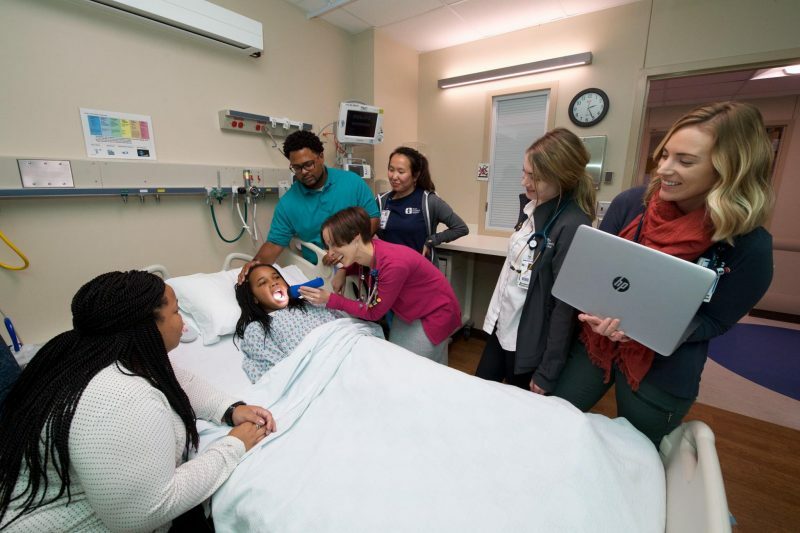 “This would not have been possible without the support of the hospital leadership team, and the hard work and dedication of all our IT staff, nursing and physician informatics teams,” he said.